Sunrise is the area of Mt. Rainier National Park closest to Seattle, and Crystal Mountain is conveniently located nearby. Both are located in the west central portion of Washington state. 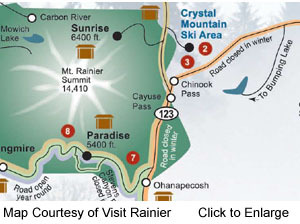 Crystal Mountain is accessible year-round from the city of Enumclaw via Highway 410. Mt. Rainier National Park is usually accessible from our side from sometime in April (when Cayuse Pass opens) until sometime in November with the first heavy snowfall. Click here to check road status. Typical Winter Closures: Cayuse Pass (Highway 123) and Chinook Pass (Highway 410) are usually closed from approximately late-November through April each year. If you’re coming from the south or eastern Washington during winter months, please make sure to come via the city of Enumclaw. Drive south on I- 5 and take exit 142A/Hwy 18 to Auburn. From Hwy 18 follow Hwy 164 through the town of Enumclaw. At the intersection of SR 410 and Griffin Ave. turn left onto SR 410. Continue on SR 410 east for 33 miles. For the Crystal Mountain Area, turn left on Crystal Mountain Boulevard and drive 6 miles. For Sunrise, continue 4.5 miles and turn right onto Sunrise Road. Follow Sunrise Road 16 miles. For Cayuse Pass, SR 123, continue 8 miles. For Tipsoo Lake and the Chinook Pass Summit, continue 11 miles on SR 410. Drive south on I-405 to Hwy 169 (Maple Valley/ Enumclaw exit). Follow Hwy 169 for 25 miles through Maple Valley to Enumclaw. At the intersection of SR 410 and Griffin Ave., turn left onto SR 410. Continue on SR 410 east for 33 miles. From I-5, take Exit 127 in Lakewood onto Hwy 512 East for 9 miles into Puyallup. At the end of Hwy 512, exit right onto Hwy 410 East and drive 24 miles to Enumclaw. At the intersection of SR 410 and Griffin Ave., turn left onto SR 410. Continue on SR 410 east for 33 miles. When Cayuse Pass is closed: Follow I-5 north to Hwy 512. Follow Hwy 512 east to Hwy 410. Thirty-three miles past Enumclaw, turn left onto Crystal Mountain Blvd. When Cayuse Pass is open: Follow I–5 north for about 75 miles to Exit 68/US Hwy 12 East. Follow Hwy 12 East for 72 miles and exit left onto SR 123 North into Mt. Rainier National Park. Follow SR 123 over Cayuse Pass to the intersection with SR 410. For the Crystal Mountain Area, turn left onto Hwy 410 and travel 8 miles to the turnoff to Crystal Mountain Boulevard and drive 6 miles to the resort. For Sunrise, turn left onto Hwy 410 and travel 3 miles and turn right onto Sunrise Road. Follow Sunrise Road 15 miles. For Tipsoo Lake and the Chinook Pass Summit, right onto Hwy 410 and travel 3 miles. **NOTE: Hwy 410 is closed east of Crystal Mountain during the winter.